Home › Blog › Join our #MakeMagicHappen campaign for a chance to win a Special Prize! Results update! Join our #MakeMagicHappen campaign for a chance to win a Special Prize! Results update! This holiday season, let us all enjoy the spirit of giving without a thought of getting. It is satisfaction and true happiness because we see joy in people we are able to help, forgetting self and finding time for others. Today we’re announcing our new Season of Giving campaign #MakeMagicHappen! This time it is YOU who will help us decide what charity cause we will be helping. Leave your ideas in the comment section under this post or elsewhere in our Facebook community, like and share it with your friends. We’ll appreciate you story explaining why you’d like us to choose this charity case. We will choose the best charity idea and donate $25,000 to it. We will even give a special gift to the best idea author — the annual subscription! Leave your ideas below in comment section from 8th up to the 17th of December. The winner will be announced on the 20th of December! Grab your chance to make the world a better place and win your special prize! Let’s #MakeMagicHappen! We’ve received more than 500 charity ideas from our followers and it was really hard to choose only one because all of them were so great! We were touched by the idea of Judy A. Bridges suggesting Paws for Veterans, Inc.! This organization trains shelter dogs for service work for Veterans, thus helping both human and animals. Judy’s idea is the People’s Choice winner as well, that’s why we’re going to donate $30,000 to support three veterans with service dogs! Our congartulations and an annual Magic Jigsaw Puzzles subscription go to Judy! 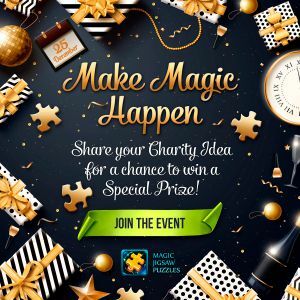 We really appreciate your continuous support of our charity campaigns and would also like to give a gift for the most active supporter of our #MakeMagicHappen campaign who helped spread the word across different social networks. A monthly subscription goes to Steffanie Hill!